We are besieged with messages about who we should be, how we should look and what we should know. If we pay attention we see “ordinary courage” everyday … in children, co-workers, students, parents, friends, family members, strangers and even in ourselves. 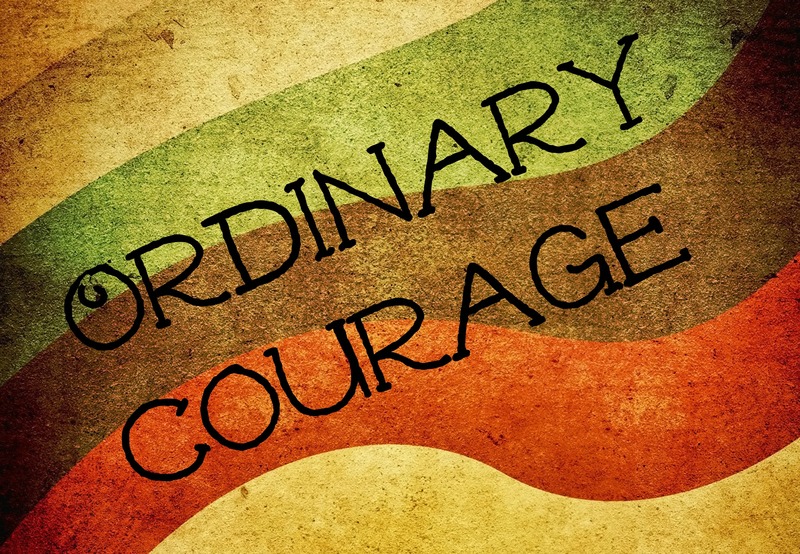 The great thing about ordinary courage is that it leads to wholehearted living which leads to real human connection and a lot of other good stuff like love and kindness and grace. This month we invite bloggers to share stories and thoughts about Ordinary Courage. Publish your posts by Tuesday June 11th and share your link here, and we’ll post the final link list on Wednesday morning, June 12th. We ask that all who participate in the synchroblog include a list of all the month’s synchroblog posts and links at the end of their post. If you know other bloggers who might also want to participate, feel free to pass this invitation on. ***Note from Liz: This whole idea is inspired by the author, speaker and researcher, Brené Brown. I highly recommend her books, videos, Ted talks, classes etc. Whether we realize it or not, lots of people all around us are experiencing great pain and hardship. Maybe someone has lost their job, gotten a divorce, is going through depression, or worst of all, has lost a family member or loved one. As followers of Jesus, how are we to respond in such situations? We have all heard some horror stories (or maybe you have experienced this personally) about some of the things well-meaning Christians say and do toward others who are experiencing personal tragedies. Christians often say or do some pretty foolish (even offensive!) things in such situations. Often this is because we want to help, but we don’t know how. We don’t know what to say. We don’t know what to do. So we say foolish things. We stay away when we should be present. We are present when we should give people space. We bring things up that we shouldn’t, or we don’t bring things up that we should. So for the May 2013 Synchroblog, we want to invite you to write a “How to” post about helping Christians know what to do (or not do) and what to say (or not say) when others are going through times of personal tragedy. Maybe you have experienced a tragedy in your life, and want to share a story about what someone said or did which was rude, condescending, and insensitive. Or, more positively, maybe you want to write about what someone said or did that showed love, care, and concern. Either way, provide some suggestions on what others can say or do which would have been helpful to you in your time of personal tragedy. If you are not comfortable sharing stories like this, maybe you want to write about something you said or did which others have found helpful in their painful experiences. Of course, if you write from this perspective, be sure that your words or actions really were helpful to the other person! Ultimately, the goal of this synchroblog is to give Christians some suggestions for loving and caring for those around us who are experiencing great personal loss, pain, tragedy, or disaster. Publish your posts by Tuesday May 14th and share your link here, and we’ll post the final link list on Wednesday morning, May 15th, to add to the bottom of your posts. If you know other bloggers who might also want to participate, feel free to pass this invitation on.